We from the Python room like to have a clean list of starred messages, so only relevant and really liked messages stay on the starred list forever. In order to do that, we unstar messages from time to time. Since unstarring is limited to the sidebar list within Chat, this is not really a simple thing to do. That’s where this script comes in: When you visit a room’s star list, you can now select multiple starred messages simply by clicking on them. 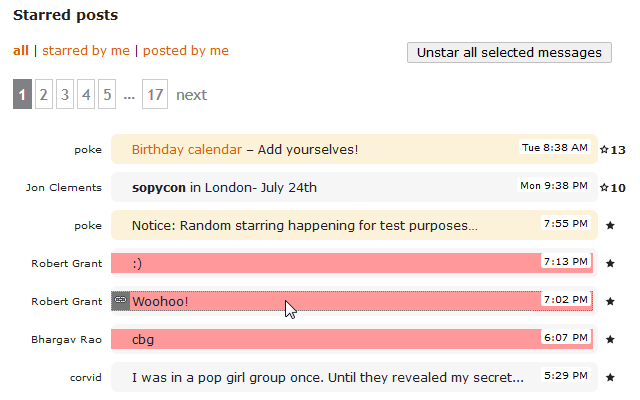 And if you have made your selection, you can click the “Unstar all selected messages” button to unstar them all.